Acquired from the above by the present owner circa 1978. To be included in the forthcoming Jean Fautrier catalogue raisonné being prepared by Mme Marie-José-Lefort. Fautrier aimed to keep the purity of paintings using a matter which is the apotheosis of matter itself, the 'white, luminous matter made up of 'high impasto' based on Spanish white and zinc white" (C. Siebel, Jean Fautrier, Musée d'art Moderne de la ville de Paris, 1989, p. 17). He further comments: "Fautrier engraves the notches of his expressional rage and of his passion with an extremely clear conscience. But he also spreads the most tender pastels on this elaborate substance, thus unveiling the lyricism he has at heart" (C. Siebel, Fautrier, Exh. 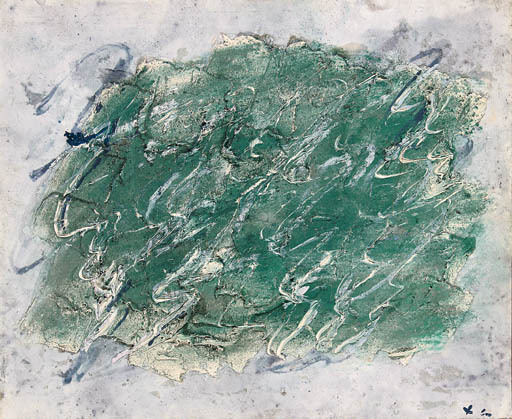 Cat., Galerie di Meo, Oeuvres 1940-1964) This work, Ramure, from 1960, is as shifting as the tides of Fautrier's passion.